An amateur photographer took stunning photos of exotic Malabar giant squirrels, which have now gone viral. Malabar giant squirrels are known for their brightly multicolored fur and large bodies. During a trip deep into an Indian forest, 39-year-old Vijayan captured shots of the colorful squirrels, which have become darlings of the internet. Vijayan, who is from India but now lives in Saudi Arabia, snapped photos of the species, sometimes referred to as Indian giant squirrels, in their natural habitat in India's Pathanamthitta District. "I felt so amazed by how drop -dead gorgeous it looked, "he told CBS News. "It was indeed a jaw-dropping sight to behold." According to U.K. newspaper The Independent, this species of squirrel can grow up three feet long – double the size of their standard gray relatives. They can have orange, maroon and purple in their coats, and are capable of jumping up to 20 feet in the air between trees. The photos were originally posted to Vijayan's Instagram account, where he has over 20,000 followers. Soon, the pictures were picked up by SWNS, a global media distributor. The pictures were hit on Twitter. Many users were fascinated by the vividly colored creatures. One user asked "How have I never heard of these beautiful creatures before?" 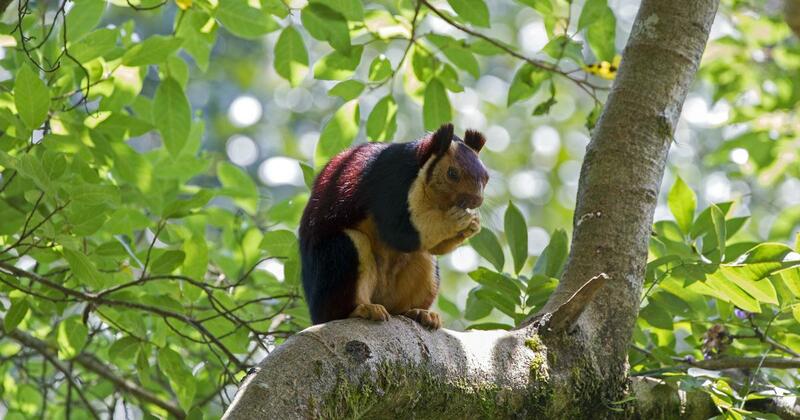 Another joked "Can we splice giant Malabar squirrel genes into humans, so I can stop paying my hair these colors?" Vijayan told CBS News he couldn't believe the amount of attention he has received. Even though he's not a professional wildlife photographer, he's inspired by the response he's gotten for his pictures. "I feel overwhelmed by all these responses I'm getting and all these responses are one of my main driving force [s]," he said.